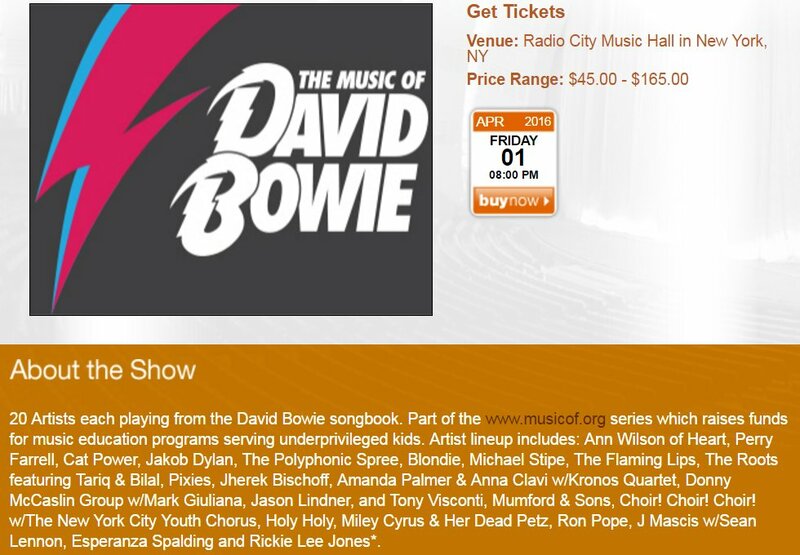 Radio City “Music of David Bowie” Tribute to Stream Live Friday, April 1st on Skype – Flaming Lips, Michael Stipe, The Pixies, Mumford & Sons, Polyphonic Spree, more! Flaming Lips “Late Show” David Bowie Tribute bumped from episode. Sean Lennon and Miley Cyrus/Dead Petz added to April 1st Radio City show. The Roots, Tariq, Bilal pull out after “miscommunication” over shared drumset. Michael Dorf and City Winery host annual tribute concerts at Carnegie Hall honoring artists such as The Who, Neil Young, The Rolling Stones, Joni Mitchell, Bob Dylan and REM. 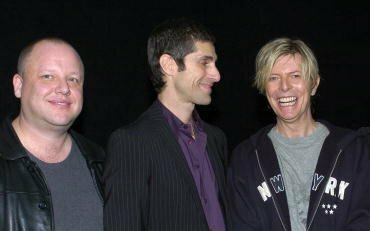 Seven months into planning this year’s David Bowie tribute, the initial line-up was announced this past January mere hours before David’s passing. With that the March 31st event instantly took on new meanings; no longer just a “tribute,” it became a memorial. No, scratch that – don’t call it a “memorial” – it’s “a poignant celebration of his music by his friends, peers and fans” in the words of Dorf’s website. As with prior shows, it’s also a benefit for music education programs serving underprivileged youth (specifically Young Audiences New York, Little Kids Rock, Church Street School of Music, the Center for Arts Education, Sonic Arts for All!, American Symphony Orchestra, and Grammy in the Schools). The Flaming Lips – a band Bowie himself was an outspoken fan of, and that has covered Bowie numerous times since the early ’90s, most notably with two all Bowie sets in the wake of his passing earlier this year – will promote “The Music of David Bowie” New York tributes with an appearance on The Late Show with Stephen Colbert on March 30th. [Update – The Lips were bumped from this episode by the late addition of Elizabeth Warren to the show’s guestlist. Regardless they taped their performance to be aired in a TBA episode in April.] A new video for their cover of “Space Oddity” is also in the works. Thursday will mark the Flaming Lips third performance at Carnegie Hall, and the second time they’ll play Bowie’s music on its prestigious stage (they performed “Warszawa” with Philip Glass there last year during his annual Tibet House Benefit). This is all a long-winded way of saying: line-ups are subject to change….